Homelessness is a societal issue that continues to plague our nation with dire concern; especially among military men and women who have fought for our freedom and continued safety as a nation; yet, many have returned home to America to now find themselves homeless, jobless, hungry, hurting, and in need of our assistance and support as they reintegrate back to civilian life in our changing society. Speak Life Worldwide, Inc. is a 501 ( c )(3) nonprofit human services, educational, charitable organization focusing on crucial human conditions among people; especially veterans. We specialize in helping veterans and their families with basic nutrition, clothing, shelter, literacy counseling , job training and placement assistance. 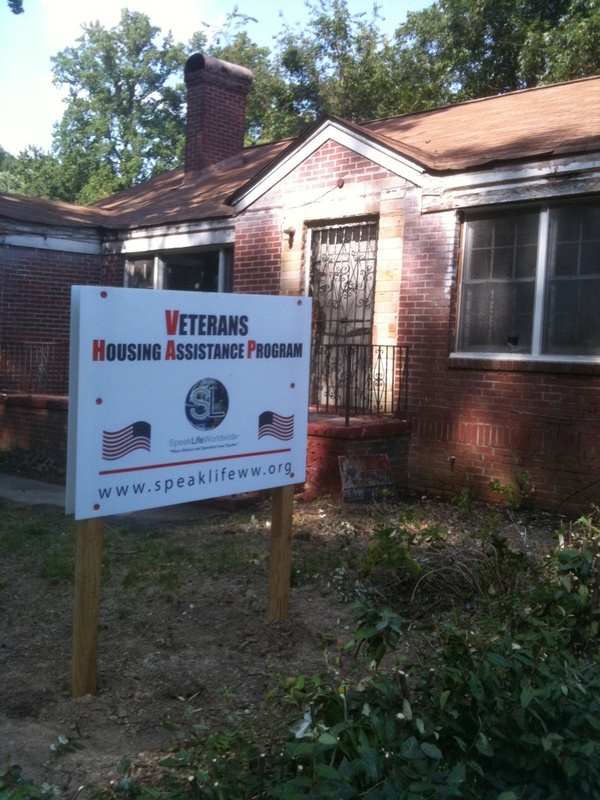 Speak Life’s Veteran Assistance Program was stabled in 2010 to serve as a catalyst for being part of the solution for the problem of homelessness among returning veterans in the 12 Atlanta, GA area counties including DeKalb Fulton, Rockdale, Henry, Clayton, Fulton, Gwinnett, Fayette, Coweta, Douglas, Cobb, Cherokee, and Paulding. A report released by the National Alliance to End Homelessness examined the number of military veterans who are now living on the streets. It found there were 3,032 without permanent homes in Georgia in 2008. That's down from 3,299 in 2007. The group found the state had a high of 5,715 homeless veterans in 2005. The study examined data from the Department of Veterans Affairs. Besides showing a decrease in Georgia, it showed that the nation is seeing an increase in female veterans and that the VA is beginning to see homeless veterans of the current conflicts in Afghanistan and Iraq. ​With over 100,000 homeless veterans in the United States, the need for our service is critical in today’s sagging economy, men, women, and children fall victim to suffering for lack of basic human needs. Speak Life Worldwide, Inc’ Veteran Assistance Program provide the follow services: Housing Assistance, Adult Literacy: reading, mathematics, writing, spelling, and speaking; Job Training: on the job training, referrals for community college, and job workshops; Workplace Preparedness /Job Readiness: Resume writing, Interviewing skills, polishing communication skills, How to dress for success, telephone and in person manner; Job Placement Assistance. Other Program Components consist of: Adult Life Skills Program, Adopt a Homeless Family, Substance Abuse Intervention/Prevention Counseling; Housing Referral Program; and Life Skills Training and Community Health Referral Program. Our VETERANS REINTEGRATION ASSISTANCE PROGRAM is located at 1500 Suite A-1 Farmer Rd in Conyers, Georgia 300012, where our qualified staff is prepared to expedite the reintegration of homeless veterans into the labor force. CEO/ Earl Cornwell is a Viet Nam purple heart veteran, who understands the challenges and trauma experienced in war and the transitioning back to civilian life. He and his staff are well-trained in their areas of expertise and are successfully involved in helping hurting citizens today. Speak Life Worldwide partners with other service agencies such as: United Way, The Salvation Army, Goodwill, local municipalities, colleges/universities and Habitat for America to alleviate homelessness and joblessness among veterans and others. Earl W. Cornwell, CEO is a graduate of Luther Rice University, Lithonia, GA. He also matriculated at Georgia State University, Atlanta, GA, with a focus on Business Management. He is a disabled veteran having served in the Viet Nam War where he received a Purple Heart. His community endeavors include serving as Director of the Dekalb Business Development Center and Mead Road Community Center for the City of Decatur, GA. Earl is a retired government employee as well as a retired pastor, having served in various congregations throughout Georgia for over 20 years. ​Gary A. F. Wright, Assistant Director is a graduate of Rutgers University as well as McGraw Hill in Boston for Design and Business. He has worked in finance for Merrill Lynch as well as serving as Corporate Graphics Coordinator, Industrial designer, Packaging Engineer, and Graphics / Marketing Director for fortune 500 companies. His corporate and business experience exceeds 20 years. Gary has been a successful entrepreneur since 2001 and is enjoying his dream of both working for himself and giving back to others through Speak Life Worldwide. Jessika Cornwell Washington, Ed.S. is an educator and for over a decade and has taught in various fields. Jessika holds degrees from Georgia Southern University, Georgia State University, and Cambridge College. She has authored several works including B.U.L.L.Y (Better Understanding Leads to Liking You), Elements of My Elementary Ego, and Season of My Serenity. She is currently developing the educational curriculum series, Breaking Barriers and Building Bridges. As an entrepreneur, Jessika has established Talented1Consulting, LLC and sits as Lead Curriculum Consultant for Speak Life World Wide.